Finally, a warning. 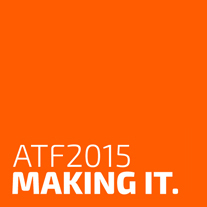 ATF 2015 is not an arts market. If you want to buy or sell theatre work, ATF is the wrong place for you. Please don’t come with a pitch to sell your show or sell your event. Instead be prepared to share the passions that drive your practice, and be prepared to listen and be inspired by others as they do the same. You’ll need goodwill, intellectual rigour, openness, generosity and stamina. You’ll also need caffeine, Berocca and comfortable shoes.